One of many Vole (Microtus) species, the Pine Vole is a bit smaller and has a shorter tail than the Meadow Vole. 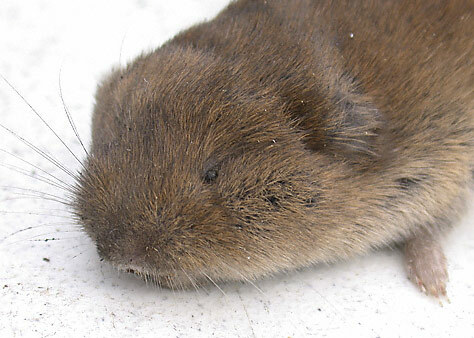 Unlike moles, voles are mostly plant eaters. These images show the tiny eyes, small, delicate feet and stubby tail which help identify voles. While moles will make long, ridged tunnels visible from above ground, voles tend to scratch out more invisible runways. Often, moles will serve as the "highway crew" and make tunnels in search of grubs and worms. Voles will often follow the mole tunnels and eat the plants which the moles ignore. Entire apple orchards have been lost to vole damage and we have seen fairly large chestnut trees killed by voles that ate their roots off. We have lost thousands of plants and countless vegetables to the voracious voles. There are very few plants that voles will not eat. They can have several litters a year, with 1-11 young per litter. Yikes! Most voles are in the genus Microtus. Despite being the most common mammal, they are seldom seen because they are usually hidden beneath mulch, leaf litter and earth. While many people believe cats can control voles, this is almost never true, especially with vole species that travel deeper in the earth. Natural predators include owls, foxes, wolves, weasels, shrews and snakes. The Mole snake, or Mole King snake (Lampropeltis rhombomaculata) is one of the few predators which can follow vole tunnels and so is one of the better predators. Unfortunately, control by predators is rarely satisfactory in a garden setting. While some poisons are listed for vole control, these can be dangerous to other animals and must be used with extreme care. We prefer to use several different kinds of mouse traps, along with physical barriers that inhibit voles (or moles) from tunneling into garden areas. In some gardens, especially vegetable gardens, it is possible to make a trench around the garden, about a foot deep. This is more easily done right after the garden is tilled. Most voles, tunneling right beneath the surface, tend to turn back when they hit the trench and they are reluctant to cross on top of the ground. It helps to make a trench down to harder ground, if possible. Vigilance is necessary and gardeners should be on the lookout for new holes on the garden side of the trench. Rob has grown potatoes and parsnips in vole infested areas using this method. Mulch or straw should be avoided in vole problem areas. In some cases, such as a bog garden or flower bed, it may be more effective to remove the soil and line the bog or bed with galvanized steel mesh (hardware cloth), a layer of rock, or heavy-duty weed barrier. Any barrier needs to be without underground openings and extend to the surface. (See our Bog Making web page for more details.) While voles can chew through weed cloth, they usually don't, especially if one patrols the perimeter and collapses any approaching tunnels. We havebog gardens protected in this fashion. Doubling or tripling a weed cloth layer helps. Again, avoid mulches and look for new entry tunnels. Snow can be a problem, since voles will travel quickly on top of the ground, under cover of snow. Traps can be one of the better methods of vole control. Traps are best set during the evening and are more effective if you can cover the traps with a box, plastic pots, or anything to make the spot darker while still allowing the traps room for motion. Here, the most successful bait has been Granny Smith apple, cut into pea-sized pieces. Traps should be placed just outside of tunnel entryways. A couple pieces of apple, dropped into the tunnel, allows the aroma to draw in the rodents. Try to trap an area, not just a single tunnel. Traps should be checked daily, especially live traps. We've tried a couple designs in live traps, some of which can catch up to fifteen mice or voles. So far, the best results have been with the type of repeater trap that has a wind-up spring. A paddle wheel flips the rodents into a metal chamber. It's important to put some apple inside the trap, in the "holding" area, in the metal pathway and also where the rodents can't get to the bait-inside the metal box on the trapping mechanism side of the device. Usually, the top on these traps slides off. Be sure to check the trap at least daily. The advantage of live traps is that you can release other animals that might accidentally get caught. We have caught shrews, lizards and even a flying squirrel in these traps. If you are not familiar with small mammals, you might want to pick up a field guide to mammals. Shrews, for example are good to release as they feed primarily on insects, worms and rodent young. Shrews often live in the same area as voles. While sharing the features of tiny eyes and small feet, shrews have pointy noses and sharp teeth. Use caution releasing shrews, they are occasionally fierce and confront much larger animals, even people! Most folks drown voles in a five gallon bucket of water. If you want to release them far away, a meadow is usually suitable; just don't release voles in cultivated/farmed areas. Regular, snap type mouse traps can be very effective in killing voles. When baiting this style of trap, try to cut pea-sized pieces of apple that include some skin. If the skin is slid under the bait bar's hook or teeth, it will be harder for a rodent to steal the bait. Again, drop a couple pieces of apple inside tunnels. Voles often turn cannibalistic and a trap with fragments of skin usually indicates additional voles. There is another style of repeater mouse trap which does not have a paddle wheel. This type has entry ramps that are spring loaded or counter weighted. Rodents go in but can't get out. So far, we have had poor results with this type of trap. Voles are bigger than common mice. For this reason, the less expensive, plastic, live mouse traps may not work well or at all. Whatever methods you use to control Voles, be vigilant and scout for shallow tunnels or evidence of new infestations. Extending the control area beyond the gardens you're protecting is a good idea. Ignoring Vole problems can lead to disastrous overpopulation and the inability to grow most plants.